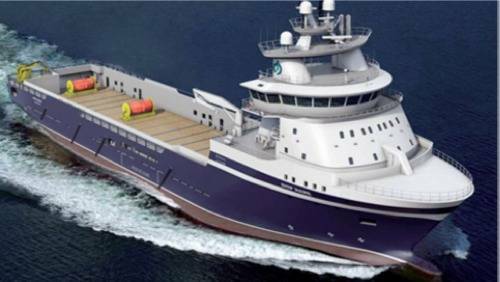 Island Offshore's new UT 776 CDG design vessel 'Island Contender' delivered by STX Brevik shipbuilders. The owners say that fuel consumption measurements show that it was correct to go for this configuration: two larger gas engines which can be used alone or together in all operational situations, and twin diesel engines if more power is required. With the actual prices of gas and gasoil it is a considerable saving to utilize gas, and from the environmental point of view it is also much better. Christening of the vessel, a ceremony with change of flag, the twenty-first in the Island Offshore fleet, and a sister ship to Island Crusader was held in Brevik, Norway. At the moment the vessel has no contract. In a few days, after onboard preparations, she will be ready for duties in the Offshore supply market.